The Sherlocks frontman Kieran Crook 'a terrific storyteller of age old quandaries'. Photos: Glenn Ashley. It had been too long – that’s how Yorkshire indie stars The Sherlocks described waiting to play Sheffield again after nine months away...but they came back with a bang taking their biggest UK tour to new heights. The Leadmill last June now seems half a world away for the hard working Bolton-upon-Dearne band of brothers who’ve since signed their first record deal, released two more outstanding singles and are on the verge of selling out a second huge national tour – all off their own backs and without releasing their fabled debut album. Now home fans were at last able to hear what frontman Kiaran Crook, his brother and drummer Brandon, lead guitarist Josh Davidson and his brother and bassist Andy have been playing to full houses across the country and how production, lighting and sounds have been taken to another level. But some things don’t change and warm-up music from Pulp, Courteeners, Jamie T and Catfish - some of the band’s modern heroes and, perhaps in some cases future contemporaries - was soon drowned out as the booming chants of Sherlocks’ Army began to sow the seeds for the gathering storm. “Sheffield!”, roared Kiaran, and that was enough, no more words were needed to share the delight of coming home to friends, family and fans from way back, this time to the sprawling but tightly packed Foundry at University of Sheffield. Keeping to the same anthem-led set list that has been so successful throughout this tour, the riotous Last Night kicks things off, while the raw and confident urgency of Escapade and Live for the Moment, the band’s two breakthrough singles that still capture the excitement of those early days, takes the bouncing beyond the sound desk. But this isn’t just an indie mosh-fest and even the most resolute fans down the front are captivated by the honest lyrics and tremendous melodies of new songs Candle Light and Nobody Knows. At only 21 Kiaran is already a terrific storyteller of age old quandaries that mean something to everyone. Brandon’s precision drumming and the intricate guitar work on the ominously haunting Formula 1 favourite Will You Be There? takes the madness further, while even diehard followers are surprised with a new country vibe version of Sheffield favourite Motions, a song which has been totally transformed from the frantic three minute version last played at The Leadmill. Latest single and Radio One favourite, Was It Really Worth It?, one of the oldest in the set and their third release with producer Gavin Monaghan, has also been nicely reworked with a fantastic new middle eight and a heightened guitar solo at the end from Josh. Its evocative first five chords, spine tingling epic chorus and brilliant lyrics like “You’re always right and I’m always left holding on to the handles of excuses” make it a fearless and timeless tune from a what is shaping up to be a fearless and timeless band. Homecoming fans went wild in the mosh pit for Sheffield indie stars The Sherlocks. The sweeping epic Blue, with Josh and Andy on soaring backing vocals and co-ordinated jumps, and long-time anthem Chasing Shadows wrapped things up with more stunning illuminations by lighting boss Craig Greenhalgh. Big fan and This is England star Thomas Turgoose was in the crowd with mates, while Bolton’s Jordan Allen, who has just spent the last month supporting the lads and watching their nightly shows, came over from Westhoughton to see his touring pals’ epic homecoming. The band were buzzing just as much as everyone else, as Kiaran told me. “The turbulence of some shows can mean they pass too quickly, even great gigs like Manchester on this tour shot by in a flash, but tonight I can remember every moment vividly as I’m sure it’s the same for Brandon, Josh and Andy. The Sherlocks on stage in front of a sold out crowd at The Foundry, at the University of Sheffield. It was also a special night for Barnsley openers Sundance whose youthful confidence and uplifting tunes like Take a Look, Cul-de-Sac and Imposter were even more impressive as this was only the second time bassist Chester Ronlik had played with lead singer guitarist Harry Walker, drummer Kyle Grattan and rhythm guitarist Owen Keane. Making it a fantastic local triple bill were Sheffield and Hope Valley’s Oddity Road with lead singer Jack Heath, guitarist Dan Brennan, bassist Joel Gilbourne and drummer Ethan Lambert repeating their self-proclaimed high energy indie rock show that had been so electrifying at Manchester’s Albert Hall earlier on the tour. 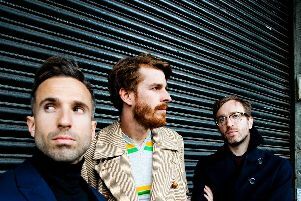 They’re also taking songs like Calling Out, Handshake and Gabriella to Mosborough Music Festival in June, but first they return to Sheffield University to play The Studio on Friday April 7. As they stand on the verge of their most exciting year so far The Sherlocks will return to Yorkshire at The Church in Leeds on Saturday April 22 and then support teenage tearaway Rat Boy including a landmark date at London’s world famous Roundhouse on Saturday May 6. They return to Leeds Festival on Friday August 25. Latest single Was It Really Worth It? is out now. For more visit The Sherlocks official web site at www.thesherlocksmusic.co.uk, follow then on Facebook at www.facebook.com/TheSherlocksOfficial, on Twitter at twitter.com/TheSherlocks and Instagram on www.instagram.com/thesherlocks. Follow Oddity Road on Facebook at www.facebook.com/OddityRoad, on Instagram at www.instagram.com/OddityRoad and on Twitter @OddityRoad. Follow Sundance on Facebook at www.facebook.com/sundancemusicuk, on Instagram at www.instagram.com/sundancemusicuk and Twitter @sundancemusicuk. Barnsley indie newcomers Sundance opened the show with 'youthful confidence and uplifting tunes'. The Sherlocks back stage with This Is England star Thomas Turgoose and pals.